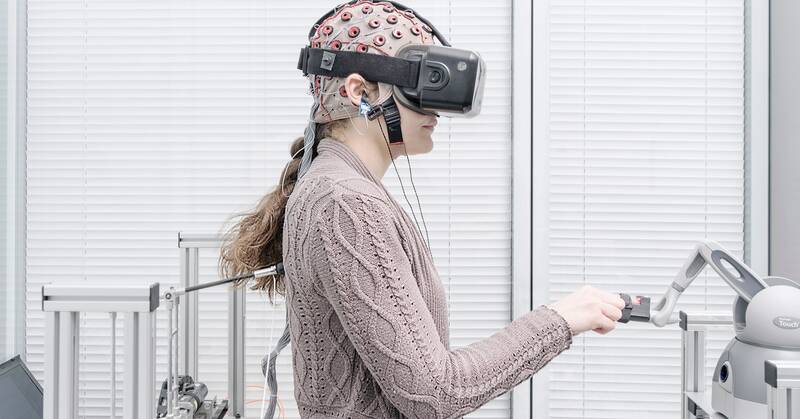 A woman tries on a virtual reality headset at a neuroscience lab in Geneva, Switzerland. This exoskeleton can be used to treat physical handicaps or to augment the wearer’s motor skills. The Defense Advanced Research Projects Agency (DARPa) is working on a similar prototype that would could turn soldiers into war machines. Neil Harbisson, who is color blind, implanted a prosthesis into his skull that converts colors into sound waves. He considers himself a cyborg. The dietary supplement Elysium contains nicotinamide riboside, which has been shown to promote cell regeneration in mice. The drug’s long-term effect on humans is unknown. Julien Deceroi implanted a magnet into his middle finger. He’s an example of a “grinder,” biohackers who operate on their own bodies. The size of a grain of rice, the NFC/RFID microchip can be implanted under the skin by a tattoo artist. The chip can be used to store data or interface with electronic devices. This anti-aging light therapy mask is meant to be worn for five minutes a day and promises to make the user look younger. The Mailpan—an implant filled with stem cells that secrete insulin—is an artificial pancreas that could potentially transform the lives of diabetics. Marie-Claude Baillif has suffered from myopathy since adolescence. Without her respirator, she would have died thirty years ago. “Nootropics,” aka smart drugs, are a class of substances supposed to improve cognitive function, memory, creativity, or motivation. Professor Grégoire Courtine of the École Polytechnique Fédérale de Lausanne implants electrodes into a paralyzed rat’s spinal cord to help it learn to walk again. Photographer Matthieu Gafsou says transhumanism encompasses a wide array of techniques and philosophies. One of the biggest misconceptions about transhumanism is the belief that it’s a new phenomenon. “We have been intimately involved with technology for a very long time,” Gafsou says. In many ways, all of us are transhumanists based on our extensive use of technologies like the smartphone, the artificial hip, and the pacemaker.